We must ponder, cogitate, muse on the dual ideas on truth. ‘Which choice holds the right opinion?’ Are we able to think for ourselves, to make our own choices based on what we think that is right or wrong? Are our thoughts and ideas constructed in our Inner Self as being part of a greater concept? Is having an opposite opinion good or wrong? And what is a good or wrong opinion on certain matters? ‘Differences of opinion do not make anyone heretical or orthodox. […] Considering that each of us has only a part of the truth and that one person’s truth is no more authorative than another’s, we should try to avoid seeing our own view as the only correct one. This cannot help but make us more tolerant of our fellow human beings, who value their choices and opinions as much as we value ours.’ (excerpts taken literally from the label’s Bandcamp page, as a statement on the definition of ‘heresy’ in ancient times versus contemporary visions on the subject, comparing ‘heretic’ as in ‘opposite to orthodoxy’ with a new vision on organically global-thinking – Ivan). More information and references on the philosophical ideas etc. on the matter: https://eighthtowerrecords.bandcamp.com/album/heresy-2. It includes, for example, a link to Evol’s Giordano Bruno, and one to Mister Nietzsche and his thoughts on heretic matters (and the results of his ideology…). Eighth Tower Records are a very young sub-division of Unexplained Sounds Group, run by Sonologyst’s Raffaele. Last year, there were some ‘normal’ albums (i.e. written, created and recorded by a band or project or sole musician, like Sonologyst itself, or Urs Wild, Adonai Atrophia and Hezaliel - for the latter, Concreteweb recently uploaded a review on their Paradise Lost album; see: http://www.concreteweb.be/reviews/hezaliel), as well as quite some fantastic compilations / samplers. I really invite you to check out the Bandcamp pages to find out more. But… The latest gathering of artists on Eighth Tower Records, entitled as Heresy, is so full of interesting acts – a compilation I could not ignore, one that I wanted to share with those who care. I do not exactly give a damn about who you are that might care; this review is my contribution to the growing world of glorious Drone / Ambient majesty. Thirteen artists contributed this time – some did it before, some are ‘new’ on the label’s roster. Yet without exception, they do belong to the worldwide elite. I will not go too deep into each single project’s history / biography / discography, because that would bring me too far, but I’ll give a short description of each one involved on the Heresy sampler. Heresy opens with Al Awwal by Bulgarian one-man horde Adonai Atrophia, taken from the recent re-release of the Metahistory album. The guy behind the project, Seraphim Veluvian, is inspired by ancient / traditional mythic, occult, religious-ethnic and esoteric themes, and that’s something you can’t ignore. The track (and so is the whole album) is based on an interpretation, following ‘researches in the Kabbalah and the Islamic Ismailism which describes the Universal Cosmogony in a very deep, logical and mysterious way’. More info will follow soon, when I will write and publish a review on that album. Anyway, this track, Al Awwal, which lasts for just over eight towers, eh, I mean eight minutes, starts very integer and divine, with a semi-Gregorian chant and soft synth lines. But soon it transforms into a very obscure and deep-droning experience, with a Lovecraftian atmosphere and some cosmic elements. Oh so fine are the female Arab vocals, returning occasionally. There is a hypnotic repetition within the rhythm, but it never bores at all. Second track is Craving Urania by the notorious Czech sound composer Vladimír Hirsch, who’s active as from the eighties. Under his own name, as well as under the banner of several other monikers, Vladimír released and recorded many hands full of material throughout the years, especially via labels like Ars Benevola Mater or Integrated Music Records. 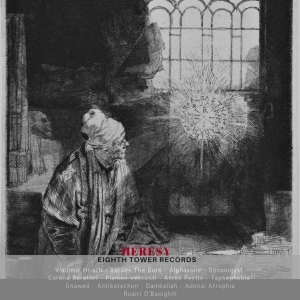 His contribution on Heresy is a monumental Drone track that continuously grows. It’s such an ominous experience, building up towards the most abyssal angles of the Industrial scene, and finalising the aural journey into a bombastic all-devastating and pyroclastic outburst. Next come Antikatechon, one of the projects by Italian born guy Davide Del Col (think also: We Promise To Betray, Molnija Aura, Echran or Ornament), with Altaria Expiationis (clocking almost ten minutes). It is a sinister and, at the same time, dreamlike piece of haunting and mesmerizing Dark Ambient, sort of divided in a few organically evolving chapters. From Iran comes Xerxes The Dark, a great and quite productive project by Morego Dimmer that surprised me more than once before. Man & Deviance is a typifying composition, being based on floating synth lines, injected with different sounds, field recordings and samples. It’s a soundtrack for some post-apocalyptic travel beyond unknown dimensions of space and time, asphyxiating and oppressive. Corona Barathri, well, what can I say. On this compilation, they’re featured with Omen Perditionis, which was reviewed by my brother Peter earlier this year; check this: http://www.concreteweb.be/reviews/corona-barathri-0. This bleak ritual is a mostly haunting ear-candy, deeply martial and warlike in execution, caused by those militant drum patterns and those bewitching invocations of my dearest Lamia Culta. Raindrops and a Gregorian choir are part of the grande finale! A soundtrack from beyond Purgatory! Plamen Večnosti (Czech for ‘the flame of eternity’) is one of the few bands that I knew from name, but had not listened to before. But with their contribution called The Father Beyond they surprise me in such magnificent way. The Father Beyond is an occult ritual, based on shamanistic voices, weird tribal drumming and eerie synths, besides some vocal samples and different sounds. It’s conjuring, and when those flutes enter, pure psychedelic, almost comatose consciousness will take over man’s rationalism. In a very near future I will publish two reviews for Taphephobia: one for the new album Ghostwood, and one for a split with Dutch glorious Kave. Both of them will see the light (actually, they recently saw the light) via Cyclic Law. Anyway, Corporeal Escape is the shortest piece on this album (3:47; ten out of thirteen compositions last for more than six minutes). It’s a magic dreamscape that has so many things to offer, despite the short length. Several synth-layers and samples / sound-collages are mingled unto one vast breath-taking cinematic soundwave. Just like Xerxes The Dark, Alphaxone hail from Iran, and I do adore this one-man (by Mehdi Saleh) project enormously. Some of his releases on Cryo Chamber have been reviewed by undersigned in the past years, like the collaboration with ProtoU (http://www.concreteweb.be/reviews/alphaxone-protou) or 2016’s Echoes From Outer Silence (http://www.concreteweb.be/reviews/alphaxone). I would like to refer to an upcoming review for a Cold Spring Records compilation, Visions Of Darkness (to be uploaded soon - and being a re-edited release which was released somewhat earlier via Unexplained Sounds Group), which shows quite a varied and probably unexpected yet vivid range of Noise, Drone, Ambient, Experimental and Ritual Music from, indeed, Iranian soil. On this album, Alphaxone are represented with Roots, an extremely darkened Dark Ambient Drone piece that reveals a fertile abundancy of sounds and noises. Damballah hail from Ecuador, a country not exactly known for a vivid Drone / Ambient scene, to my (mostly important) opinion. With Kanzo Senp, Damballah prove to equal the highest regions of the international scene. Delving deep into the secret worlds of the untrodden woods, dark haunting rituals are executed to elicit forbidden spells. This is a great combination of doomed ambience and ill-omened bass drone melodies. A fine discovery! Grant Richardson from Gnawed (see above) also runs Atrox Pestis, another sweet entity, yet quite differing from Gnawed. The Will Reach From The Heaven (Cut Off Their Hands) is a lengthy piece (13:33), standing like a monumental entity on its own. Everything starts in a coldest manner, suffocating and bleak, grim and gloomy. But slowly everything proceeds, step by step, taking its time, for you know it will eventually end in misery. Being long-stretched and distantly monotonous-nihilistic in essence, The Will Reach From The Heaven … focuses on an introspective subconsciousness (or is it an unconscious confrontation with man’s own atrocious blindness?). Heresy is, once again, a magnificent Eighth Tower Records compilation. It offers the audience some unique things within the related genres of Drone, Dark Ambient and Ritual. Highly recommended!